On selected dates we offer a One-way flotilla sailing between Fethiye and Orhaniye. Initially sailing west from Fethiye we explore the numberous coves around the beautiful Fethiye Gulf before venturing west to Ekincek, Ciflik and Bozuk Buku with the ruins of ancient Loyima, before heading into the picturesque Hisaronu Gulf to visit some favourite anchorages at Sogut with the Octopus restaurant and Bozburun famed for its Gulet building and quaint harbour. Part of a second week is spent sailing along the Datca peninsular before visitting Sailor's Paradise and Dirsek en route to Orhaniye. This cruise offers slightly longer daily passages in predictable northerly winds. - The next two weeks are spent sailing east to Fethiye from Orhaniye via Karacaoren and Cold Water Bay. Great sailing amongst some firm favourite anchorages. Saturday: Arrival Fethiye – Time to relax, stow luggage and head for the town. Sunday: Tomb Bay (17 nm) – A brisk sail across the bay to a delightful cove to dine ashore. Monday: Cold Water Bay (16 nm) – Cool off in the freshwater spring! Tuesday: 22 Fathom Cove (16 nm) – Join Rajep and his family dining bohemian style. Wednesday: Asi Koyu (22 nm) – Watch the sunset from the small family run restaurant. 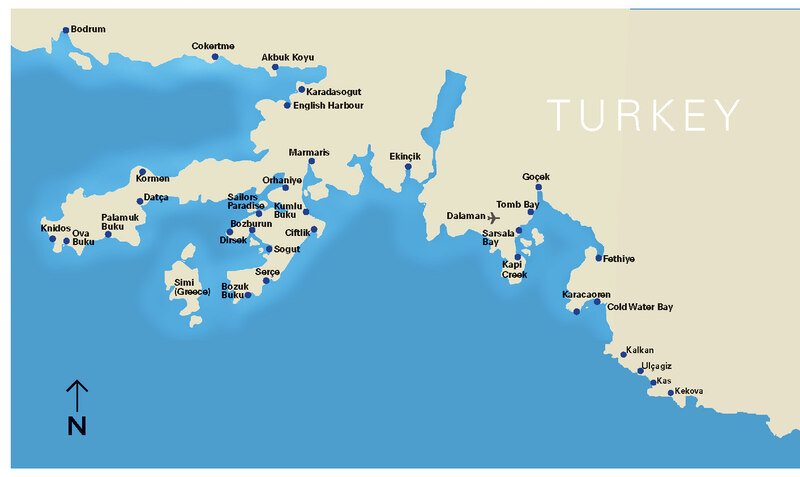 Thursday: Ciftlik (22 nm) – On arrival take a swim from the yacht before a sundowner. Friday: Bozukkale (16 nm) – Climb the walls of ancient Loymer. Saturday: Sogut (14 nm) – Dine ashore at the ‘Octopus’ a most popular restaurant. Sunday: Dirsek (13 nm) – Visit this near landlocked cove. If arriving early, anchor in the bay for a swim, before heading to the restaurants own quay. Monday: Independent Sailing – Chance to visit the old port of Datca with its street bazaar and craft shops. Tuesday: Sailors’ Paradise - The name say everything! Wednesday: Selimiye (10 nm) – For the brave try the barber shop or chill out in a bar. One week sailing options are available upon request on both of the above itineraries. This cruise retraces the Fethiye to Orhaniye route exploring the Hisaronu Gulf with its great selection bays and small harbours including Selimye, Dirsek, Sogut perhaps including Serce and Sailors Paradise before heading southeast to the beautiful bays and anchorages in the Bay of Fethiye, perhaps if time permits visiting Karacaoren before finishing in Fethiye. Saturday: Arrival - Orhaniye, Time to chill out with a swim! Sunday: Selimiye (7 nm) – A chance to shop for further provisions and take in some ‘café life style’. Thursday: Bozukkale (14 nm) - explore ancient Loymar! Tuesday: Boynuz Buku - Large protected bay with pine and olive tree cladded hills. Dine ashore under the stars in a sea lapped garden setting. An alternative chosen by the flotilla crew will be to visit the quaint village of Gocek. Wednesday: 22 Fathom Cove (5 nm) - Dine with our old friend Rajep! Regional flights from Glasgow, Stansted, Bristol and Birmingham are offered in addition to Gatwick and Manchester direct flights into Dalaman Airport in Turkey. Why not ask Sunscape to quote for a flight inclusive package to include Flights, Airport transfers and the Yacht on flotilla.